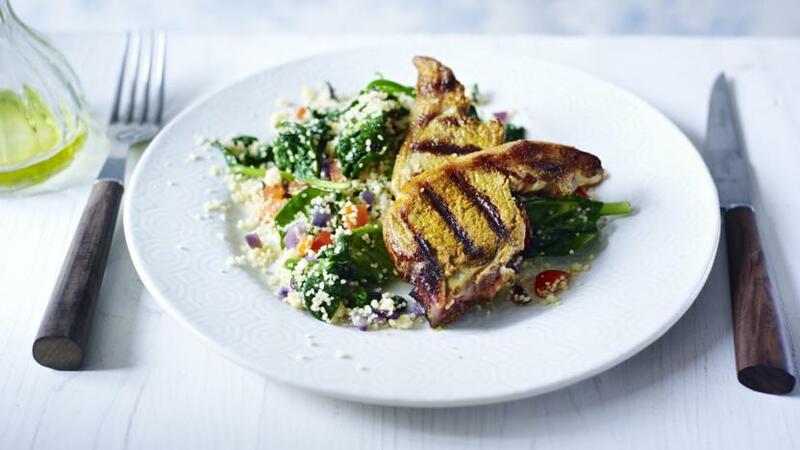 This simple dish of spiced lamb and couscous makes a great midweek meal. For the spiced lamb, rub the lamb chop with the chilli powder, cayenne pepper, turmeric and season with salt and pepper. Preheat a chargrill pan and add the oil. Add the lamb and cook for 4-5 minutes on each side. Remove from the heat and leave to rest for 3 minutes. For the couscous salad, heat the oil in a pan and add the red onion and pepper. Cook for 5 minutes. Add the spinach and remove from the heat. Put the cooked couscous in a bowl and add the spinach mixture. Mix together. To serve, put the couscous in the centre of a plate and top with the lamb chops.